So you’ve recently gotten engaged, you’re sporting the pre-wedding glow, and now want to celebrate with friends and family before the big day. Planning the perfect engagement party can be difficult though, so here at Waterside Events, we want to give you a few tips to help you create a memorable engagement celebration free of stress, so you can save your energy for planning your wedding. Traditionally, the bride’s parents host the couple’s first official celebration. It depends on your personal preference and what you’re looking for from your special day. If you’re wanting your parents and your future parents-in-law to co-host your engagement party, speak to them about it. After all, it is your engagement celebration and you want it to be a memorable one. Otherwise, if you’re looking to plan your own engagement party, it will be a good practice run for your wedding day. It’s sort of like a taste test of what goes into planning an event and may be the deciding factor into whether you plan your wedding day also or hire a professional. It’s a rule of thumb that whoever you invite to the engagement party, you also invite to the wedding ceremony. Again, it will depend on what type of celebration you’re looking at having – if you want a small, intimate affair, stick to close friends and family. In regard to invitations, a formal printed invite is not required but if you have the time and budget that can incorporate them, they are definitely a nice touch. Otherwise, if you need to cut your budget, social media or email invitations will do just fine. Depending on how many people you’re planning to invite, you can usually make an engagement party work almost anywhere. 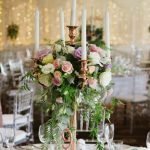 When choosing your venue, think about the environment you’re aiming to create: if you like the idea of having an elegant affair, you may want to rent out a private room at a country club, restaurant, or event venue. If you want a more low-key celebration, a house or even a large table at a restaurant may be a better choice. At Waterside Events, we can take on the stresses of planning your engagement party and create a memorable celebration for you and your family. Whether you just need the venue, or the extra support from our award-winning events team, we can help! If you wish to discuss your options with us or make an enquiry, just head to our contact page.